Stefano Comini is the winner of the maiden edition of TCR International Series. 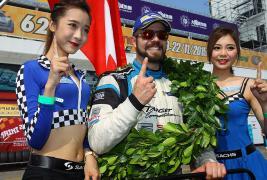 The Swiss driver from Target Competition was crowned after winning race 2 in the final round in Macau. Champagne splashes also for Comini's team, winner of the title themselves. Comini was also awarded with the OMP Trophy reserved to those drivers who use OMP gear or, at least, have an OMP sticker on their car body.